The Salkantay trek is our most popular alternative to the Inca Trail, and although it really started life as an alternative for when people couldn't secure a permit for the "classic" Inca Trail, in recent years this trek has become something of a favourite and many people now rate the Salkantay trek as better than the Inca Trail. We rate it as a little tougher than the classic trek, and it takes you a little higher, but the reward is some of the best high-altitude trekking in South America, with views of stunning snow-capped peaks and glaciers before you drop down into the humid semi-tropical environment around Machu Picchu itself. You might not be able to spare four days for our full Inca Trail holidays to Machu Picchu, but if you'd still like to experience the drama and beauty of the Inca Trail then perhaps our "Short" 1 day Inca Trail is for you. This trek begins by getting the train to Km 104 of the main trail, from where you have roughly six hours of trekking before you reach the famous Sun-Gate at the end of the full Inca Trail, looking out over Machu Picchu. You'll then head down the mountain to have a relaxing night in Aguas Calientes, before returning to Machu Picchu the next day at dawn to see the ruins in perfect condition and without hordes of tourists. You have a full day at the site to explore at your leisure, before you return to Cusco by train in the evening. This morning we will pick you up and take you to the station to catch the train from Cusco, following the Urubamba river to Km.104 of the railway, where you will descend and cross a footbridge to begin your hike at the Inca site of Chachabamba. After a brief visit to this lovely ruin with its water channels and fountains, you start the four-hour ascent that takes you past spectacular overlooks above the great valley, then below a lovely waterfall near the delightful site of Wiñay Wayna (Forever Young). You ascend through this largest and most exquisite of the Inca Trail sites, passing its chain of ritual baths and elegantly curved terracing, and then joining the main Inca trail. You then follow it across a steep mountainside and up narrow stairways through lush, humid cloud-forest of giant ferns and broad-leaf vegetation. Suddenly, you cross the stone threshold of Intipunku (Sun Gate) and encounter an unforgettable sweep of natural beauty and human artistry –a backdrop of twisting gorge and forested peaks framing the magical lost Inca city. If you'd like something a little different, with all the beautiful scenery of our Inca Trail holidays but without many other trekkers at all, the Lares trek (also known as the Weaver's Way) is ideal. With relatively gentle altitude and scenery, it's a great trek for families or less-experienced trekkers, or can make a good acclimatisation trek for those wanting to prepare thoroughly for a more difficult trekking option. You can either do this as a standalone trek from Cusco or (as we have it here) extending into four days with a visit to Machu Picchu. Either way, you will have two fairly high mountain passes to deal with, but otherwise the Lares trek offers fairly gentle paths rich in birdlife and with some stunning views across the Cordillera to peaks like Pitusiray as well as some lovely glacial lakes. Although there are several different ways of getting to Machu Picchu, our favourite is still the classic four-day trek known as the Inca Trail. Following the ancient Inca road between Cusco and Machu Picchu, this trek is the highlight of many a holiday in Peru, and guaranteed to be something you remember forever. 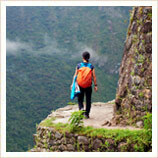 The classic Inca Trail trek starts just past the village of Piskacucho in the Sacred Valley at a point known as Km 82. This marks the end of the road from Cusco, and is 82km along the railway between Cusco and Machu Picchu. You then cross over to the southern side of the River Urubamba and begin climbing up into the mountains. The trail then continues for four days, crossing several high mountain passes until on the morning of Day Four you arrive at the Inti Punku Sun Gate overlooking Machu Picchu. Along the way, you pass some fascinating Inca ruins before you even get to Machu Picchu, especially the village of Wiñaywayna on the final day. Perched among the steep slopes of the valley, this is generally held to be one of the most atmospheric of all Peru's Inca ruins. At the end of each day, you will arrive into camp, which will already have been assembled for you by your team of porters, so all you have to do is relax and wait for dinner, which will be prepared for you by our expert chef. Then, after a good night's sleep, you will get up, eat breakfast and then trek out of camp while the porters take all the tents down and then catch you up! The campsites are located at as low an altitude as possible but you are going to be sleeping at over 3000m for the first two nights, and only just under on the third. 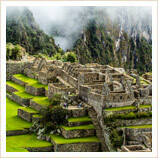 Another point to consider is the welfare of porters on your Inca Trail holidays. Good companies will make sure that porters are properly clothed and equipped, as well as properly fed and properly paid. However, unfortunately this isn't the case across the board so please make sure that any company you deal with treats their porters correctly. Our Inca Trail partners work with one particular village with whom they have a long-standing relationship, and as well as making sure that the porters' needs are met while working, they also are involved with social and educational programmes for the village. Both the Inca Trail treks (the classic 4-day trek and the shorter 1-day Inca Trail) require you to have one of the special Inca Trail permits, issued by the Peruvian government. Anyone trekking the Inca Trail, whether tourist, Peruvian, guide or porter, has to have one of these, and only 500 permits are issued for each day. That might sound like a lot, but these permits go very quickly once they are issued at the end of January, especially for busy months - which for the Inca Trail is more or less any time from May to October. Obviously we will check for permits before accepting any 2019 Inca Trail holiday bookings, but it is definitely something that needs booking in advance. The real key is in the difference between the rainy season (roughly from November to March) and the dry season (April-October). It's not that it rains all day, every day during the rainy season, but it's almost certain that you will see some rain every day, and when the showers come they tend to be quite heavy. It's not a problem organising an Inca Trail holiday at this time (except for February, when the Inca Trail is closed every year) but if you can schedule your trek for the dry season, it's probably more comfortable. During the dry season, you're likely to have clear skies and fine weather, although these do pose their own problems. During the day, average highs of around 19-20°C are a little deceptive: at these altitudes the sun is very fierce and so you'll want good sun cream, a sun hat and shades, not to mention shorts. However, because the air is so thin, it loses heat very rapidly once the sun goes down so night-time temperatures are only just above freezing in July and August. This isn't a problem once you're in your tent - here at RealWorld our tents and sleeping bags are all good quality four-season gear, with REI thermarests to make sure you're warm and toasty. However, if you want to sit around with people after dinner and have a chat, you'll want a few layers on - things like fleeces are perfect. In the fringe months at either end of the dry season (April/May and October/November) we'd recommend a thin waterproof layer (fold-up anoraks are perfect) and possibly even waterproof over-trousers, just in case you get the odd shower - it means you'll avoid any risk of having to put damp clothing back on next morning. You should always make sure you have footwear with adequate ankle support as well. Can you do the Inca Trail in trainers? Yes. Should you do the Inca Trail in trainers? Not if you value your ankles! Chocolate, energy drinks or coca leaves!